This is the most popular trail in Redding, a contiguous well-kept scenic paved path that stretches from the city's iconic Sundial Bridge all the way up to the impressively large Shasta Dam at the base of Shasta Lake. With no defined starting point there are many different locations where people begin on the trail, but the most populated section begins at the Sundial Bridge. For the purposes of this description, I'll assume the South side of the Sundial Bridge is the starting point of the trail. It doesn't take long to lose the bridge crowd if you start heading in either direction on the trail. If you decide to take the trail East, you will follow a loop around the Turtle Bay Exploration Center and find yourself along CA-44 where the trail continues for another mile before it abruptly ends. If you decide to cross the Sundial Bridge then take the trail West, you will be on the "main" trail that follows along the Sacramento River for approximately 17.4 miles before reaching Shasta Dam. Once you leave the bridge the trail will never feel crowded, but expect to occasionally pass by other walkers and bikers along the trail. You'll soon pass Caldwell Park, the other most popular section of the trail where there is a small dam. Heading further North, you will briefly pass a neighborhood before reaching a more scenic section with some mild "roller-coastering" hills that lead up to Ribbon Bridge aka Sacramento River Trail Bridge where you then cross to the opposite side of the river. From here, there is a section of the trail that head back South which most people who do not want to continue further North will take. This section provides a loop back to Caldwell Park, where there is a bridge reserved for trail use called Diestelhorst Bridge to bring you back to the main trail to reach where you started. If instead of looping back you head North, you will be on the least populated and longest section of the trail. 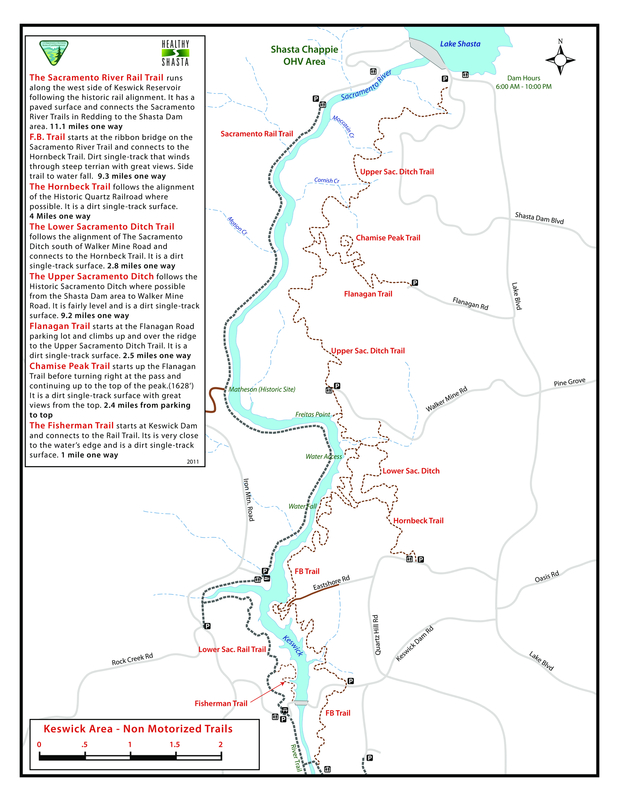 This section of the trail is known as the Sacramento River Rail Trail. It is sometimes separated in trail guides from the more popular Sacramento River Trail, but they can be thought of as a unit. There are some steep hills including "Heart-rate Hill", but it will eventually level out for the last several miles. You'll see more bikers on this area of the trail than walkers, and a lot less building. You can really enjoy the scenery on this part of the trail, and feel more isolated. There is a pretty cool, short tunnel that you will pass through and before you know it you'll have reached Shasta Dam! But wait, the dam is quite tall so prepare yourself for a 1.5 mile climb on a paved road that isn't technically part of the trail but increases your elevation by almost 400 feet to reach the top of the dam. You'll be rewarded with fantastic views of Shasta Lake and the Sacramento River. You can also cross the dam where there is a nice grassy picnic park and Visitor Center. From Redding, CA. Take CA-44 to the Sundial Bridge. Park in the Turtle Bay Exploration Park lot. Follow towards the Sundial Bridge.